I think I scared a doctor today, which is too bad because she was kind of cute. The funniest moment was the “doctor check” with the first of the cute young female doctors. She had my x-ray from a few years before on her computer screen but didn’t comment on it. She did a quick heart check and sent me on my way so fast I wasn’t sure I’d heard her correctly. She was like “get out” and I was like “but the old guys usually keep me around a minute and tell me nothing you’re only keeping me 45 seconds”. That was followed by blood letting and other tests until I got to the endoscopy phase. A lot had improved. They had a comfy chair for the numbing medicine phase which was much better than two years before when I had to position myself. It was all very relaxing. Then I was taken to the endoscopy room (same as two years ago) and was surprised to see the doctor was young and cute rather than the old guy from two years before. Then the doctor started the camera phase and I started the retching phase. She rattled off a bunch of stuff and let me watch the screen and was fine until she needed to adjust things and I felt the tube move and then the next retching phase started. When it was all over she rattled off a bunch of stuff that sounded important (main point: no cancer) but I didn’t catch all the rest. I kept assuring her she did great and it was merely my natural aversion to choking on cameras that created all the drama. Also, it was better than barium. I got home and took a nap, then it was finally time to eat breakfast. This entry was posted in Japan, Personal, Random on August 31, 2017 by DELively. Heading off to bed relatively early so that I can get up in time to drink some tea and some water. Won’t get to eat anything though. I’m already in a mandatory fast. After that, though, all I’ll be doing is filling in forms and then traveling one station away for the annual health check. After a couple hours of exam I’ll get to come home and take a nap whilst some medication wears off. Then I’ll finally get to eat something. This entry was posted in Japan, Life and Stuff, Personal on August 29, 2017 by DELively. Not much to write about. This is the last full week of fake work before my real work starts up again. I’ll enjoy it as much as I can, but even if I didn’t have fake work, I’d be feeling blue. The last week of summer is always kind of blah. Even though actual work hasn’t started, and our girls aren’t attending actual school, our schedules get busy. Our oldest had club the entire summer, but even our youngest starts having activities. This means we don’t even get a chance to do a last minute Tokyo Disneyland Trip (which saves us the heart attack of the entry fee, so it’s not all bad). I’ve got to start prepping for the coming term, which always makes me feel blah. I do have a health check coming up on Wednesday; that may make for an interesting time, in the same way a Chinese curse encourages. This entry was posted in Japan, Life and Stuff, Personal, Random on August 29, 2017 by DELively. 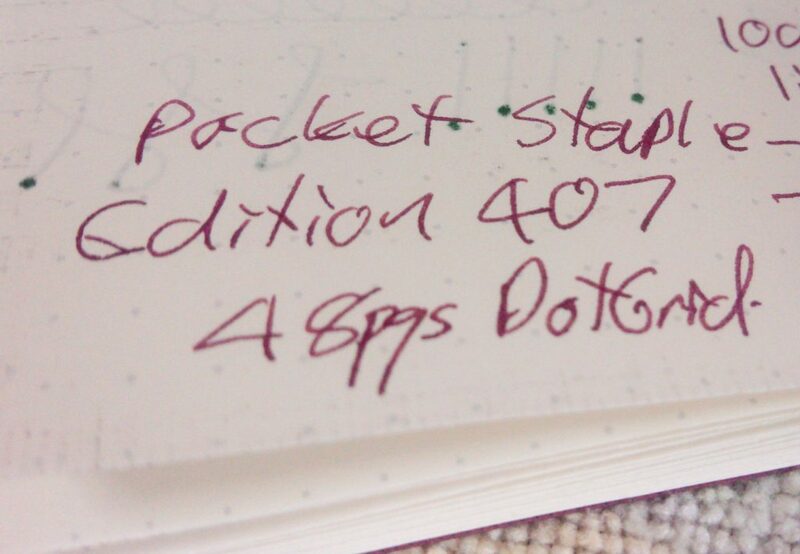 I like the Story Supply Co. Pocket Staple – Edition 407 enough that I’m going to use another copy as soon as I can just so I can abuse it more. The Edition 407 is named in honor of the 407 backers (this author included) who supported the original Kickstarter campaign. The original notebooks were nice, and still among my favorites, but it’s interesting to see how they’ve refined their production quality. The notebook looks great. 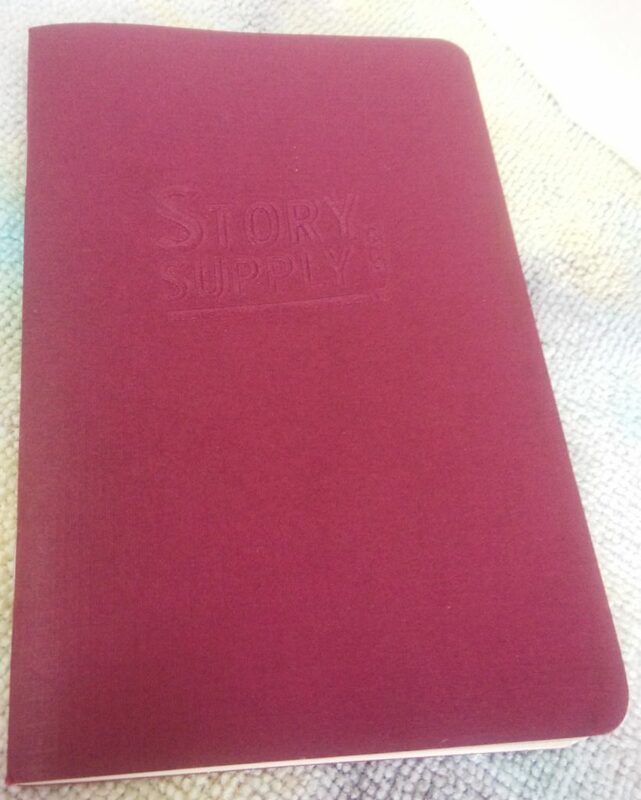 I especially like the 100# linen-finished burgundy cover. Unfortunately, because I kept it in a notebook cover, it remains pristine and hasn’t been given an honest test. The front cover. It looks new and that isn’t right for a long term review. Detail of the embossing on the front cover. Inside, the 70# cougar paper is excellent. It doesn’t feather and is pleasant to write on. Only a couple of inks bled through, and only when I was trying to make them bleed. Even Wancher Matcha, which is usually the heartbreaker, didn’t bleed unless I tried to make it bleed. Close up of some horrible handwriting on top of some bleed through. The green dots are Wancher Matcha. My only complaint is a minor one. The insides of the front and back cover have writing and rulers on them. 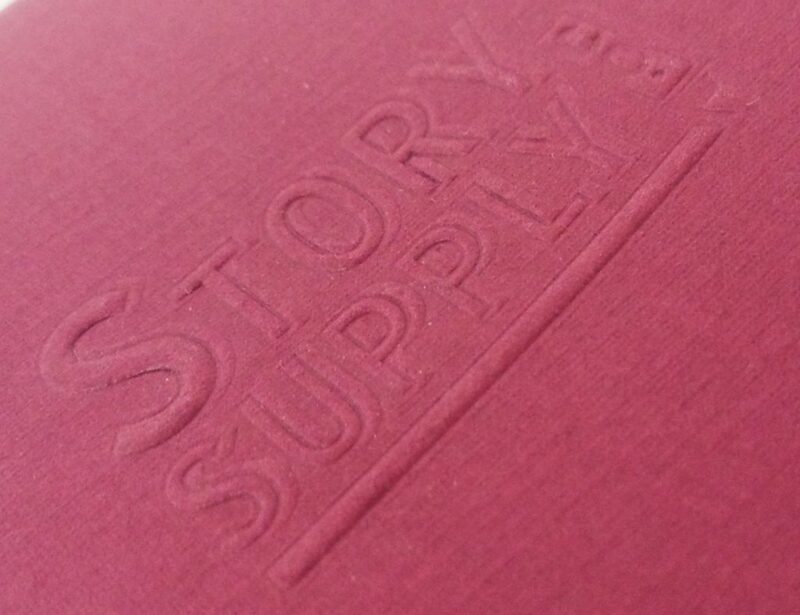 The writing explains the Story Supply Co. mission and offers a place to make a table of contents. The problem is, all the writing is black on burgundy so it’s difficult to read. I personally would prefer to have the covers blank inside so I can make my own messes. Once my current food journal is used up, I’m going to jump my planned notebook queue and use another Edition 407. I’m interested in seeing how well it holds up after being carried in a pocket for a couple weeks. This entry was posted in Notebooks, Review and tagged Story Supply Co on August 27, 2017 by DELively. After carrying the Old Church Works Quad Field Notes Leather Notebook Cover for over 20 months now, I’ve reached the conclusion that its strength is its weakness. Although it has aged beautifully–the patina compared to when it was brand new is awesome–the thick leather never softened as much as I’d hoped. Although I open and close the Quad several times a day, it still won’t stay open when I just let it sit and try to transcribe my notes. It’s easier to take the notebooks out and open them. The Quad cover showing off its excellent patina. Part of it is my fault as I started using it to hold a full complement of four notebooks knowing that would make it uncomfortably thick. In fact, it’s as thick as keeping a small paperback with leather cover in your pocket. However, it is designed to hold four notebooks so I thought I’d use it as intended. The Quad with four notebooks is quite thick. However, I’ll probably be either dropping down to two notebooks, or simply pocket carrying the two I use the most and keeping the Quad in my book bag with the notebooks I don’t use very often. This is not the Quad’s fault, but a problem with me constantly changing my system. Also, the Quad protects notebooks so well you can’t really test much about the notebooks other than the paper. The only durability issues I’ve noticed with the Quad are that the elastic band holding the cover closed is starting to fray. At this point it’s only an aesthetic issue, but it is something to watch. I still like the Quad better than the Midori Passport sized, and will probably start using it again eventually, but I’d still love to see a version with thinner, softer leather. This entry was posted in Field Notes, Notebooks, Review on August 26, 2017 by DELively. I got my pen back and that pretty much shut down all other operations. I’ve mentioned before how I sent my Nakaya Cigar Portable in for work and then got the wrong pen. After a long wait, I got the correct pen back. However, once I had the pen in hand, I had to start playing with it and writing random nonsense. I enjoyed having it back enough that it’s clear that it’s now a permanent part of the collection. It’s also already back in my Sinclair Seven (Plus One). Unfortunately, I didn’t write anything useful with it. It was just fun to have it back and fun to play with. This entry was posted in Japan, Pens and tagged Nakaya on August 26, 2017 by DELively. Life intervened again with She Who Must Be Obeyed coming down ill this evening. This had me cooking and has me reminding our oldest she has to do dishes. This involves periodically chasing her off our living room sofa. There is something about the living room sofa that causes the two oldest women in the house to immediately fall asleep as soon as they sit on it. This something is so bad that I actually have to make our oldest get up off the sofa before I can leave the room. If I don’t, she will be asleep again in a few minutes and the process will start again. Even if she’s sitting up and playing on her phone when I leave the living room the something will cause her to fall asleep sideways with her phone somehow still gripped in her fingers. This makes my job a bit more difficult as the sound of her phone hitting the floor was the Dad Signal calling me into action. This entry was posted in Japan, Life and Stuff, Personal on August 25, 2017 by DELively. 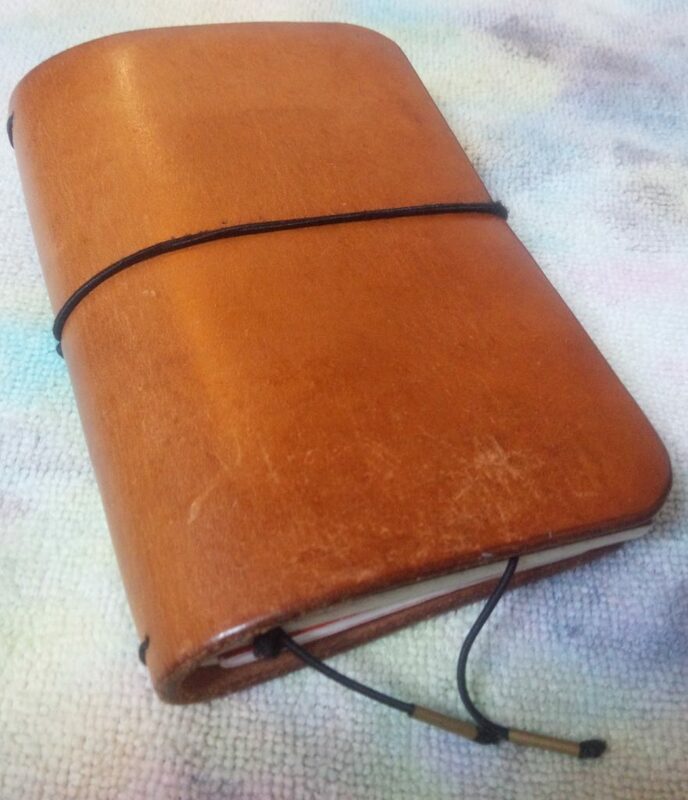 For 20 months or so I’ve been carrying the Quad Field Notes Leather Notebook Cover from Old Church Works and the entire time I’ve had it filled with four notebooks with different uses. As much as I like it, it’s probably time for a change. The cover has held up well, despite a couple issues, but that’s fodder for a different post. 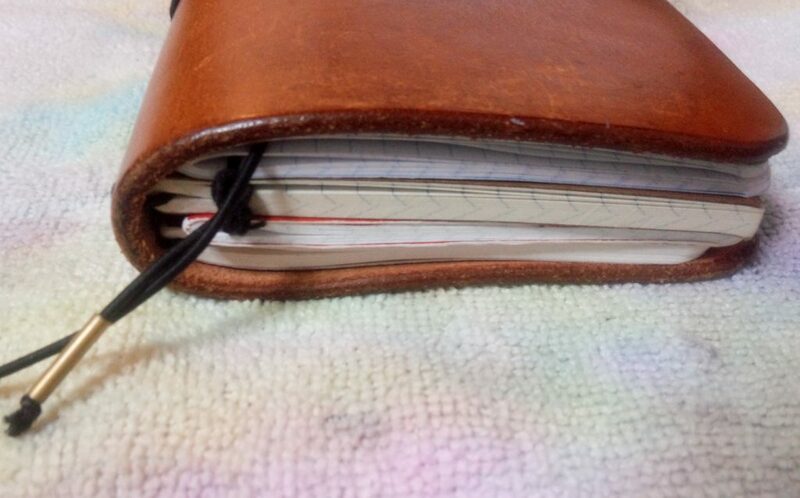 The main issue is that, over time, I’ve not only stopped using three of the four notebooks, but I also feel I’m not getting a good sense of how durable the different notebooks are in the pocket when they are protected by a thick leather cover. Because of that, I’ve decided that it’s time to shed at least two notebooks (the 10 ideas and the book Bible), and start pocket carrying the food journal and the random notes notebook. I’ve done something like this in the past and found I got more use out of the random notes notebook than I am now. However I use them, it will definitely lighten my everyday carry. But that’s also part of a future review. This entry was posted in Notebooks, Personal, Writing on August 24, 2017 by DELively. Spent part of the day working on a project and then working on another project. I’m making little progress with either, but the latter (notebook reviews) got cut off today as life intervened. Nothing major, just lots of little annoyances that ate up some time. There are lots of steps to the process, with several of them being “No really, I’ll use it, I promise”. More on that in a future post, though. This entry was posted in Japan, Paper, Random on August 23, 2017 by DELively. Thus far, his wish has come true, but in an odd way. We’ve had a mercifully cool summer. It’s been humid to the level of “breathing liquid” but the temperature has been in the high 70s/low 80s Fahrenheit (26-28 Celsius) which is a lot better than usual Tokyo metro area temperature of “scorched earth”. The trade off has been lots of rain and a few migraines. Today, for example, we kept the air conditioner off most of the day. However, about the time it got so humid we decided to turn on the air conditioner, we had an impressive cloud burst. I hope this lasts. However, I suspect we’ll have a hot September. I have to be good and sweaty by the time I get to work, I guess. This entry was posted in Japan, Life and Stuff, Random on August 22, 2017 by DELively.